Happy Neurodiagnostic Week! I’m Martha Ross, an IONM clinician primarily working in Nashville, Tennessee. In just a few months I will be celebrating seven years with SpecialtyCare. It seems like every person in the IONM field has an interesting story about how they found the profession. My own story is no different. After graduating from college I moved from my small home town in Georgia to Nashville. I quickly landed a job working as a personal assistant to a neurologist. And the job was just that, a personal assisting position. I managed her home, children, grocery lists, dry cleaning, pet grooming, anything you can think of. I knew this would not be a long-term career choice for me. Thankfully, I developed a close relationship with the neurologist and she acted as a mentor to me. She invited me to shadow her at the hospital and during that time I was introduced to the team working in neurodiagnostics. This team specialized in recording pediatric EEG for Epilepsy detection. The timing of this experience was near perfect because that hospital, Vanderbilt University, was creating a brand new neurodiagnostics school and they were scouting for students. I excelled in the neurodiagnostic program, soaking up information, eager to learn as much as I could. I found neurology and neurophysiology to be endlessly interesting. During my time in the program, I completed clinical rotations in Clinical EEG, Long-Term Continuous EEG Epilepsy Monitoring (LTM), Clinical Evoked Potentials (EP), Polysomnography, and Intraoperative Neurological Monitoring (IONM). I knew straight away that I wanted to integrate both EEG and IONM into my career path. I graduated the top of my class. Luckily, through a few conferences and network events, I connected with some clinicians at SpecialtyCare and the rest is history! I soon earned my credentials in both EEG (R. EEG T.) and CNIM and have been very pleased with my role as a surgical neurophysiologist (SN). A few years into my time with the company, I started serving as a preceptor for the students in the SN1 Training Program. 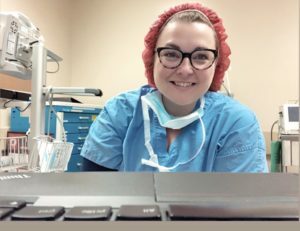 The students would start their training experience in Nashville, work alongside preceptors in the OR environment, then several weeks later relocate to join their own permanent teams. I really enjoyed this role, as it gave me the opportunity to pass along knowledge, encourage students, and help cement the concepts needed to become a successful SN. Not long after this experience, I also served as a Clinical Instructor. This role allowed me to walk alongside a SN1 who relocated permanently to my market in Tennessee. I acted as a mentor to this SN1 until she graduated from the SN1 Training Program, earned her credentials, and was promoted to SNII status. Although she has since moved markets, I remain very close with her and I’m so proud of the work she does. In early 2018 I began serving as the Regional Education Coordinator (REC) for the South. This role has integrated many of my passions. I continue to serve as a clinician in my market, work closely with all the SN1 students as they train in Nashville, lead our local preceptors, and ensure training objectives are being met. Another aspect of this role is identifying clinical practices that can be improved upon in my markets. I have really enjoyed the challenges that have come from this role and look forward to many more. I would have never imagined myself in this career field after graduating from college. It seems to me that a series of doors and opportunities were presented to me and I was fortunate enough to be guided by people in the field I really respect. This career field is an interesting choice. For those who are considering IONM, I can promise it brings excitement. Every day requires quick thinking, flexibility, and mental engagement. Every surgeon, patient, and procedure is different. This is one of the many reasons I love this profession, the variety it brings. Each day when I leave the hospital, I know I am making a difference in the lives of patients. I consider it a privilege to provide feedback to surgeons intraoperatively, ultimately helping give a higher level of care to our patients. This has been and will continue to be a very rewarding career for me.